Categories: Body Care, Body Wash Items. Tags: €10 & under, anatomicals scrub, body, body scrub, scrub. Think of your body as your kitchen floor, sometimes it needs more than a good clean. What it needs is a good scrubbing. so use this wonderfully scented exfolliator and go to work on your skin. Come on, more elbow grease is required here, and look, now you’ve missed a bit. Know what? You would be a terrible domestic help. Unlike many things that fade and eventually disappear from the minds of lesser mortals, your looks linger in the memory, forever to be remembered by anyone fortunate enough to gaze upon the glorious luminosity of your skin. and who is responsible for such total recall? Arnie? no, ummm, err, ah, errr (we nearly forgot our own name for a moment) anatomicals, creators of this truly unforgettable body scrub. but then unforgettable is what we are. 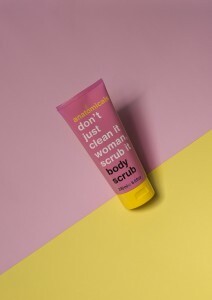 From Anatomicals, the company that only wants you for your body, comes this wonderfully don’t just clean it women scrub it scented pink grapefruit exfoliator, in a pink grapefruit tube, that buffs and polishes flakey post-holiday skin with a bravura sense of charm and wit, that has become the Anatomicals trademark. Rub a dub dub, this is no po-faced scrub. This clever deep cleanser, from the company that only wants you for your body, will leave skin fabulously fragranced throughout the day. What’s more, this fresh and fruity skin treat contains ground walnut shell to gently slough off dead, dull skin leaving it stimulated, energised and smooth with a healthy glow in time for take off! Apply to damp skin in circular motions. Rinse thoroughly. Use two to three times a week for best results.